Keith Reinhard has spent 5 decades shaping the modern advertising business. His creative vision drove some of the industry’s best-known campaigns, from "You Deserve a break today" to "Like a good neighbor, State Farm is there." 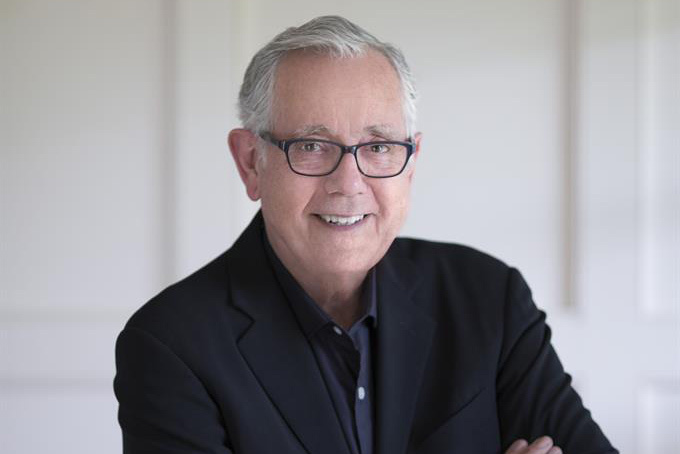 He helped found Omnicom Group, and turned DDB Worldwide--of which he is now Chairman Emeritus--into one of the premiere global agency networks. In 2015, Reinhard joined industry legends like Lee Clow, John Hegarty and Bob Greenberg as a recipient of a Clio Lifetime Achievement award. I was his student at the Cannes Young Lions Storytelling Academy in 2014, and ever since, I've been fascinated by his zest for life and passion for advertising. When he enters the room to talk to me, he carries himself with a humble, unassuming demeanor. He even carries a pen and paper, ready to learn something new. Do you believe that passion trumps talent? I think the recipe for creative achievement has three ingredients. One is talent. There’s nothing you can do about the size of the gift of talent. Second is skill. You can do something about skill. — you can learn and you can practice. But the third ingredient is passion, which is the most important of all. When you look around, you’ll see plenty of examples where passion has prevailed, and at times, trumped a small gift of talent or an average skill. Persistence is the daughter of passion. And once you have that passion, you have to persist and keep persisting hard. Because along the way there are many rejections and failures. You’ll learn from each time you fail, if you persist at pursuing your passion. How did persistence play a role in your career? When I graduated from high school, I knew that I wanted to get into advertising. But I had no possibility and I had no connections. I was from a very small farming community where people didn’t even know what advertising was. So, the passion was there but the possibilities weren’t evident. There began my persistence. I moved to New York City 30 minutes after graduating, and was quickly rejected by agencies in New York. Seeing no possibilities I went back to the midwest and got a job in the biggest commercial arts studio in Chicago. I got to work with some of the most famous creative directors and art directors. And every day ad agencies would come by, and I would ask them for a job interview. And I could never get one. I had been working as an art director so I thought my book was pretty good. And how did you end up being a copywriter? Finally, I scored an interview at a big Chicago agency to meet the creative director. I opened my book and he wasn’t too impressed, but said, "We don’t have an opening for an art director but we do have an opening for a copywriter." By this time I’m 29 years old, married with two kids. He’s offering me a job as a junior copywriter and I said, "I’ll take it." It took me 10 years out of high school to get my first job at an agency. That’s persistence. And the persistence prevailed through your career? Yes. For example, in 1981, after doing category-redefining, award-winning and sales-winning work for McDonalds, I got a to call to say, "Your agency has been fired." By this time I’m the president. My first responsibility on Monday morning was telling the agency that we lost our most important client and there’ll be no job loss. I gave each person a hundred dollar bill. And I said, "Don’t worry. We’re going to replace this business." Then I called the CEO of McDonalds and said, "I’m not calling to complain. I’m calling to alert you—you’ve gone overnight from being our most important client to being our most important business prospect. We’re coming back." They stopped being in love with us, we didn’t stop being in love with them. I can never forget the pitch. We presented at the DDB Chicago office on the 40th floor and we had window washers scaffolding on the 42nd floor. When we were about to announce the new campaign, we signalled the window washers to come down and we asked the client to look out the window and see the new slogan, "Did somebody say McDonald's?" We got the business back. And that was persistence. Over the years, you’ve created great work, but you’ve also built great relationships with people. Was that mindful? I love people. I’m inspired by people and I learn from people.I had wonderful influences growing up. My grandfather was a father figure for me and he taught me the importance of building relationships. He was an auctioneer with the skills of a showman. All the people in the county would come just to watch him sell cows, barns and furniture. He taught me how it can be fun to sell stuff and that showmanship is an important part of salesmanship. And when you create a customer, you don’t have to worry about creating a sale. When I became the president of the agency I institutionalized the management priorities— people, product, profit— in that order. We had a credo that said "everybody is somebody special." So appreciation for every individual, the dignity of every individual and seeing the potential of every individual has been my priority. This people-first philosophy fed into DDB and into my life. You’ve been a big believer in what Bernbach said. What’s one of your favorite quotes of his? He was my creative idol from the start. He was the Picasso of our business. He knew all the rules and then he broke them. And he said, "Rules are prisons. Rules are what the artist breaks." That inspired me. You have plenty of other interests in life. For example, you are on the board of Jazz at Lincoln Center, and jazz is a passion of yours. Did your interests help in making you a better creative? Jazz is an amazing metaphor for creativity and creative organizations. In the mid-1990s, at our international conference of all our creative directors, I had Wynton Marsalis come and talk about how to build a creative organization. I wasn’t sure if he was going to make it. So I had videos of Wynton on each of the subjects I wanted to discuss. I would show a video and we’d have a discussion. So after one video, I went backstage and there’s Wynton. So instead of me mounting the podium after the lights went on, it was Wynton Marsalis himself. I have a photograph of one of our creative directors with his jaw literally hitting the floor. And what did Wynton talk about at this conference? He started with telling us that the first thing you do when you start a creative organization is you surround yourself with people who can do stuff you can’t do. He said, "I know a saxophone player, and I don’t know how a human being does that. I could never do that." Then he mentioned that everyone shares the same passion, the values and the goal. But each individual has a talent they bring in, very different from each other. In jazz we have something called the "call and response." Trumpet calls with 16 bars, then the saxophone responds—16 bars. So on and so forth. But most importantly everyone is expected to be creative and improvise, all within a framework. They all start at and end at the same time. None of them is as good as all of them, and the final product is amazing. Later, we had a Q&A, and I asked, "Wynton, what happens when you work very hard on a composition and the New York Times doesn’t like it, and people walk out at intermission. How do you feel about that?" And he rolled his eyes, and said, "You can’t just be weird man, people got to dig it." That taught me great appreciation for the importance of the audience. And I think that’s great advice for advertising people. We have a product at Lincoln Center, that business can subscribe to, where a group of jazz musicians come in to a business and talk about these ideas and perform, to illustrate how organizations can be run based on the jazz philosophy. Do you have a leadership mantra? My mantra for leadership is from Lao Tzu, who said, "When the task is successful and the job is complete, the leader will be largely invisible." That’s an amazing model for leadership. If you can put together a culture, a team or a team of teams that can go out and do it, and somehow put them in an environment that inspires creativity and encourage them, then the flowers of creativity only blossom and grow. Tell us about one of the biggest business challenges you’ve tackled in your career. Well, the single business challenge was that of creating DDB Worldwide, because it required merging two different cultures into one new culture. And it had to happen after we surprised hundreds of people in both cultures. There was no preparation and there was no early announcement, only because two of the companies we joined to form Omnicom were public companies. We had to do everything after the markets closed on Friday night and before they opened on Monday morning. So we had to contact all the managers of agencies around the world and we had to contact all the clients of every one of those agencies on the weekend. On Monday morning when it was announced civil wars broke out all over the world. What Picasso taught us about creativity is very true while bringing two cultures together— the first task is destruction. You have to actually destroy both cultures and preserve the foundation that brought them together. My dream and my passion at the time was to create a new creative force on the beliefs and philosophies of Bill Bernbach. When someone asked me, "Who’ll be the new Bill Bernbach?" I said there will be 100, and they will have different names, but they will embrace the philosophies of Bill and they will know how to apply them, and expand on them for their own markets and clients. So that merger was the biggest challenge. For 2 or 3 years, there was a question whether we could do it. And when was that moment when you realized it was a good decision?We started winning business all over the world, so that was good. And I was absolutely committed that we were going to make this work as well as we had imagined it would. And we did. While you were out changing the world of advertising, what happened at home? How did you balance the world of advertising and family? I’m not sure I did a good job. But I didn’t miss many soccer matches. When in Asia I tried to make trips that could happen during the week so that I could be back for the weekends. In Europe, I could do three countries in three days and be back home for the weekend. And when I was with my family, I was totally focused on them. I had these compartments in my brain and each little cabinet had a drawer and when it was Friday night or Saturday morning the advertising door shut and the family door opened. My wife is a tremendous inspiration and continues to be. She was the best account executive I ever worked with. She reads every word I write, whether it be a speech or an article. And if she doesn’t like some of the stuff, she tells me what’s wrong with it. She’s taught me so much and continues to. You’re a voracious reader. Tell us about some favorite books— on advertising or otherwise. Everybody should read "The Lemming Condition" by Alan Arkin, the actor. It’s a story about a lemming named Bubber. And Bubber can’t understand why all his uncles and aunts are getting ready to jump of the cliff. He says, "I’m not sure if I can even swim, why would I want to do this?" He talks to his friend the crow, and eventually decides on something creative. Finally, when he walks off, he says "I’m not a lemming anymore" and they ask him what he is and he says "I’ll let you know when I find out." I found it to be a great allegory for creative people— to break the pattern and to always question the conventional. I read a lot of stuff. But, I haven’t yet learned to read novels. And I should. And I will.